Place bread cubes in greased 2- quart baking dish or casserole. Mix eggs, milk, sugar and 2 Tablespoons bourbon in bowl. Pour over bread cubes; press with back of spoon to coat bread cubes with mixture. Bake at 350 degrees F. for 40 to 45 minutes or until knife inserted in center comes out clean. Meanwhile, heat caramel topping and remaining bourbon in saucepan until nicely warmed. 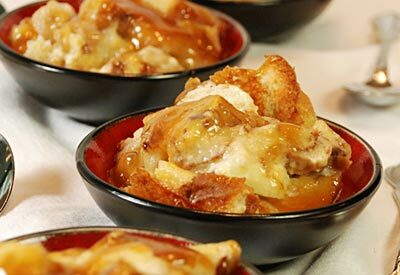 Pour bourbon sauce over warm bread pudding and serve.